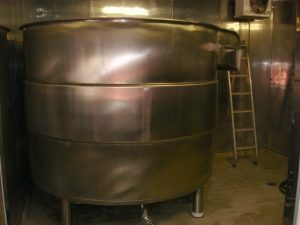 1 fermenting tub / milk tank, make Etscheid, type: KT, with 2.400 lt using content, standing, in stainless steel, with double wall, closed tank with dome lid, with agitator on top, outlet, Ø: 1,81m, H: 1,70m. 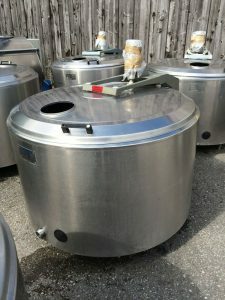 2 CCTs, each 20 hl net- / 24 hl gross content, in stainless steel, with 60° cone, coolable over 1 cooling zone in the wall with glycol or ice water, isolated, covered, with manway, spray head, gas connection, outlet, Ø; 1.350mm, height: 2.600mm, without papers, the tanks wer in use with 2 bar. No name plate existing. Price, free loaded on truck: 9.350 € / Tank, o.n.o. – 5 x 15 hl storage tanks, make Schulz, in stainless steel, standing, with manway, spray head with cleaning pipe, armatures, sampler, outlet, built 2005, Ø: ~1,40 m, H: 2,0 m.
1 flat conical fermenter, make Kaspar Schulz, with 76,51 hl content, standing on 4 feet, in stainless steel, coolable over one wall cooling zone, in top bottom with over pressure valve, sight glass with put on lamp / lightning, spray head, in wall on top with ladder hanger, sight glass DN 100, with cleaning pipe DN 40, with vacuum valve, sample valve DN 10, sleeve R1/2″ for PT100, outlet armature DN 65 with butterfly valve, built 1997. Ø: ~ 2.060 mm, H: ~ 3.050 mm. 3 x 59.000 lt flat bottom tanks, make Kaspar Schulz, in s/s, used for storaging of water, single wall, with manway, spray ball, pulled down cleaning pipe, level display, sampler, light angled bottom to outlet, with outlet, ladder hanger, Ø: 4m, total height 4.91m, dismantled for each 10.500 € for sale. measurement: L: 1.200 mm, W: 1.200 mm, H: 1.980 mm, weight: ~260 kg. Further information or pictures to above offers we send you on request. 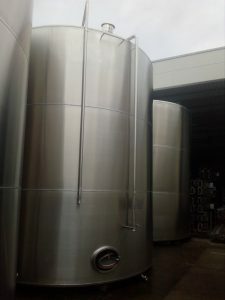 yeast tanks, fermenting tanks CCTs, storage tanks, bright beer tanks /BBTs, beer transport tanks, dispensing tanks, hot water tanks, water tanks, wine tanks, tanks with agitator, CIP-tanks, wort acidification, blender, syrup tanks, sugar tanks etc.